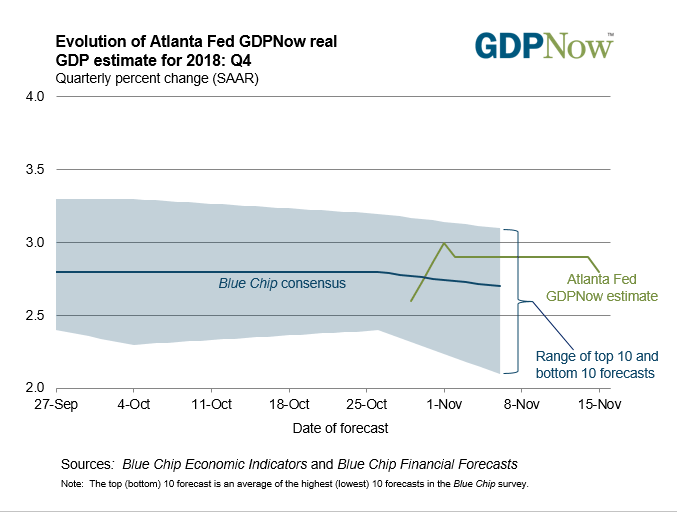 Odds are increasing for a surprise slowdown in the economy and a sudden halt to Fed rate hikes. That’s odds, as in Fancy Dan in the 5th at Pimlico. There are so many forces in play, so many lags in the effect of Fed action, lags in reporting, and a political situation without precedent that the economy is very tough to read. History says that economic slowdowns are often sharp-edged, but seen only in the rear-view. “Data dependent” could mean several things, the need to intercept too-rapid job growth, or reacting to wage increases if they appear. But this wig-wag from the Fed is a shift from pre-empting unsustainable conditions to caution, and not pressing above neutral unless the fact of inflation appears. Of course, nobody in or out of the Fed knows the location of neutral. Most guesses are near 3.00%. However, if the data stream begins to slow in real time — let alone how slow it might be in six months under the cumulative weight of three years of hikes — the Fed will revise lower its sense of neutral. The best forecaster of the Fed is the 2-year T-note. Its maturity is so short that it’s price and yield is always driven by expectations for the Fed’s overnight cost of money. Barely one week ago 2s had risen to 2.98%. The Fed is presently 2.25%. That 2.98% was a clear forecast for three more Fed hikes, at the next meeting on December 19, then March and June. 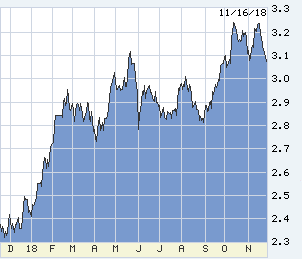 This morning 2s thumped down to 2.81%, a long way for a short-term security and the lowest since September, touching this level only on stock-crash days. 2.81% is a re-pricing of the Fed’s coming top from 3.00% to 2.75% — maybe just two more hikes. The 10-year determines mortgages. 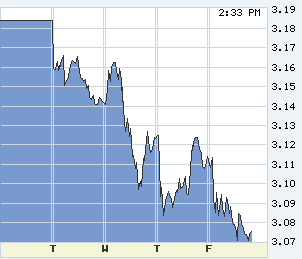 It double-topped at 3.23% in October and again in November, and has plunked to 3.08% today. Mortgages are just barely above 5.00%. If 10s break 3.06% going down… I am clutching my two-dollar ticket on Fancy Dan. So, where is the not-fire, the evidence for slowdown? Housing is obviously softening in several markets, but it should. Six years of prices rising twice as fast as incomes and housing should slow, even adjusted for supercharged urban purchasing power among technology-employee hordes. Even a significant housing slowdown is not likely to spiral as in all previous recession precursors because we have not overbuilt and have not weakened credit. But housing still counts, especially its underestimated wealth-effect. The stock market weakness is obvious, but not yet chewing into the biggest gains since 2009. Stocks do have the potential to unwind painfully, especially if the FANGS lose teeth. Next to housing, the most credit-sensitive sector is automobiles. Uh-oh. Auto leasing is really a credit deal based on interest rates, and leasing — 30% of sales — flattened two years ago under the weight of the Fed. Average lease payments have risen only from $425 to $450, but that’s a lot to rent a car. Payments for cars purchased with loans since 2014 years have jumped from $460 to $550. Even though you get to keep the car, a steep increase and the effect will show in new numbers. “Anecdotal evidence” is always suspect, a fancy term for story-telling. However, when the Fed chair says that he hears “a rising chorus of concern” from business about negative effects of tariffs, listen to the music. 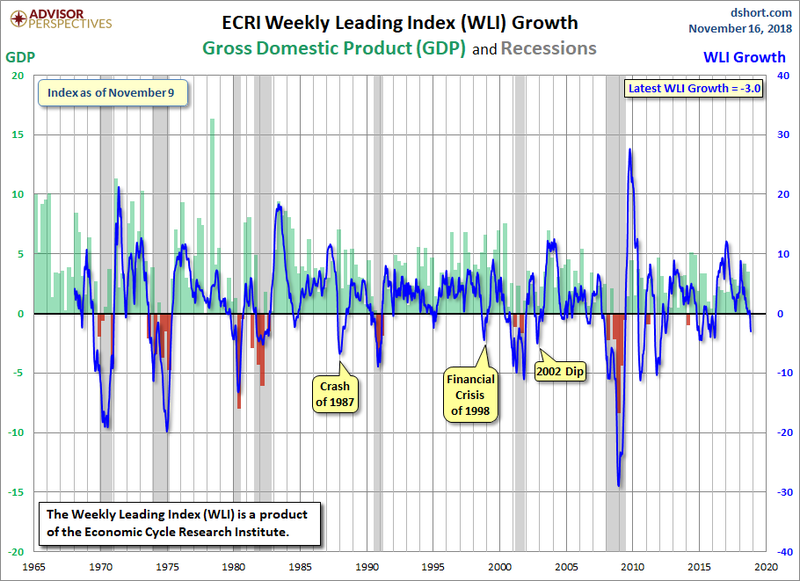 One of the best indicators of economic turns is the Economic Cycle Research Institute, ECRI, which since 1965 has had only one mistaken call of recession (and it insists that it was right in 2011, but the recession was intercepted by new QE). In the chart below the ECRI has in one month shifted from yellow to orange warning. Vertical lines do that. Overseas data is all deteriorating. A survey by a Chengdu university found that 22% of China’s dwellings are vacant, about 50 million units excluding units unsold by developers. The bulk of these empties are third-homes held for investment. China funds its spending in part by confiscatory interest rates (too low), has crushed the fight of capital overseas, artificially prevents a nosedive in the yuan, and is shutting down sketchy but high-yielding financial investments. Thus domestic investors pile into housing to get a return, hoping for capital appreciation big enough to offset vacancy. See Miami condos, 2004-2007. Oil was supposed to be on the way to $100, pushed by demand and new sanctions on Iran. Instead we have non-sanctions, and the Saudis have pumped like mad to get back in global good graces post-Khashoggi. When prices topped $60, US frackers went nuts. NYMEX crude has dropped from $76/bbl to $56/bbl in just six weeks. Then there is politics, and they matter. 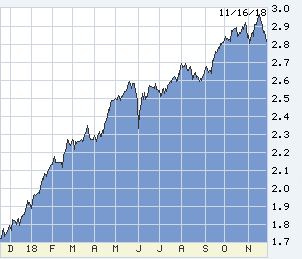 The yield on the 10-year T-note jumped from 1.75% to 2.50% in weeks after Trump’s election, having nothing to do with the Fed just exuberance at pro-business government. And early this year upon passage of the tax and spending bills jumped again to 3.00%. A political reversal or its prospect can likewise reverse exuberance. The results and effects of last week’s election (it feels like two months ago) are in energetic debate, but the chances of Trump’s re-election have gone down, and the Republican majority in the Senate will be at risk. 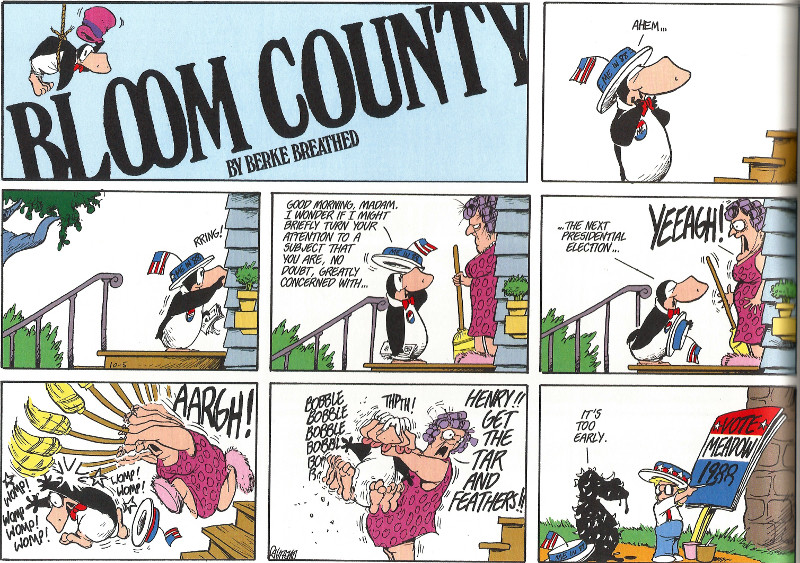 The president’s post-election demeanor has not helped. Incoherent policy has kept many big things on hold overseas, several of them dangerous. Economic activity thrives on confidence, and its erosion is in play. Regulated by the Division of Real Estate www.nmlsconsumeraccess.org. Copyright © Premier Mortgage Group. All rights reserved. Loan products are not available outside of Colorado. NMLS Company ID #3001.